The remain of residence KAN-IN-NO-MIYA was established in 1710, (Hoei Era 7) having a Price NAOHITO as founder, one of the sons of Emperor HIGASHIYAMA. It is one of the four imperial families - FUSHIMI-NO-MIYA, KATSURA-NO-MIYA, and ARISUGAWA-NO-MIYA - , and still inheriting imperial lineage till today. Relation between the remains of today and the original is unknown, as the original residence was burnt down in 1788 by the Great Fire of Tenmei Era. 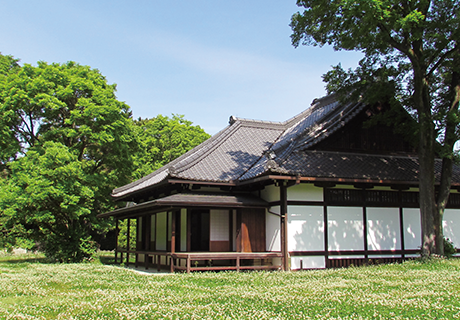 KAN-IN-NO-MIYA remain of residence was originally used as house till the family moved to Tokyo in 1877(Meiji Era 10). After they moved out, it had been used different purpose, as such Aristocracy Hall and court. Finally it has become what it is today, ever since Kyoto Branch Agency of Imperial Household Ministry was established in 1883(Meiji Era 16). 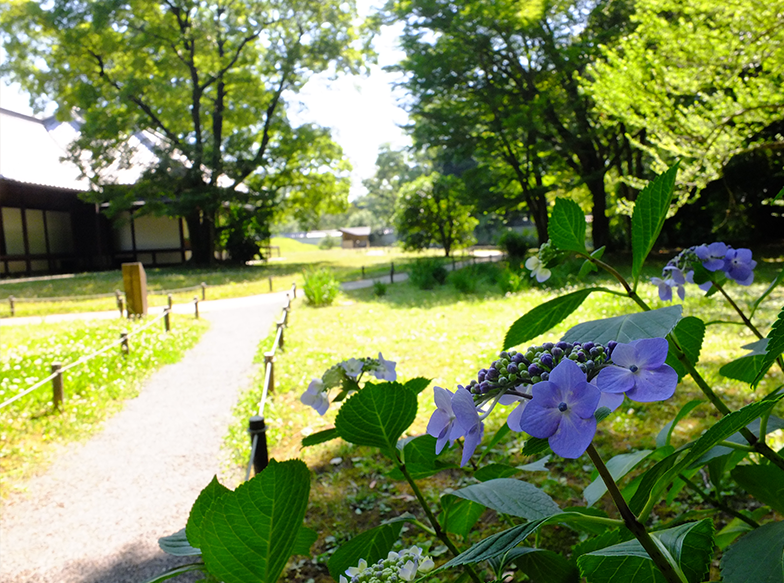 Having had major rennovation from 2013(Heisei Era 15) for three years, and reconstructed the garden of former Imperial Household Department in 2014, it has become what we see today. KAN-IN-NO-MIYA remains of the residence is constructed with four buildings that surround the courtyard. 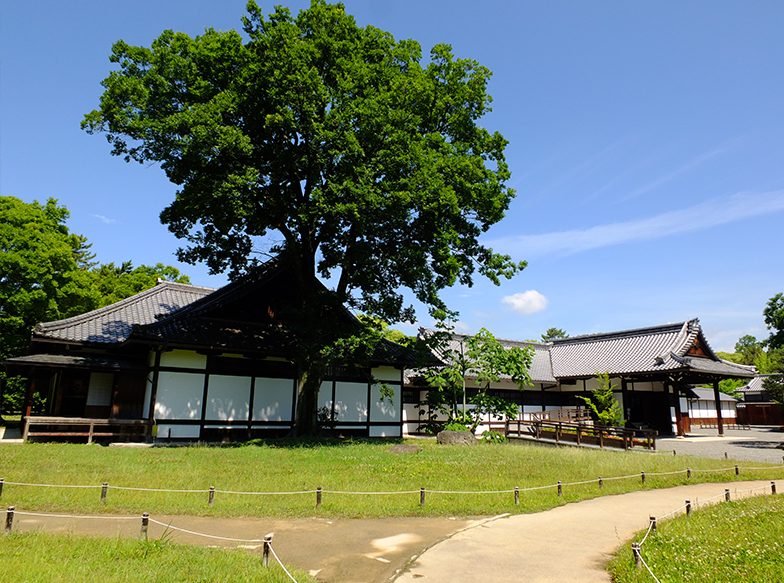 Its southern building, which has exhibition room, is built in a traditional Japanese style of architecture called "Shoin-zukuri." Japan has distnct four seasons and every season has its charm. 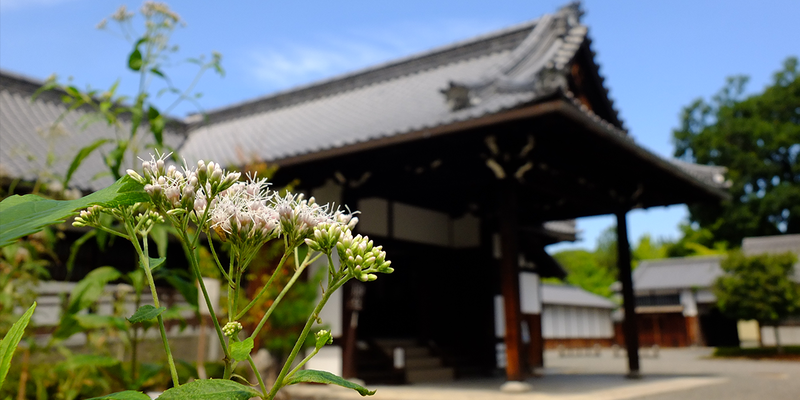 Not only you could enjoy various flowers in bloom each season in the courtyard, but also you might encounter Aosagi(Herons) or other rare wild bird, which could rarely seen in ordinally life in Kyoto. We hope you enjoy and get relaxed walking across the courtyard. 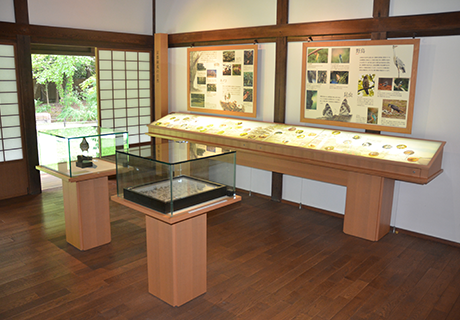 At Storage Exhibition room, we exhibit pictures, unearthed article of nature and explain about Kyoto Gyoen history and nature. 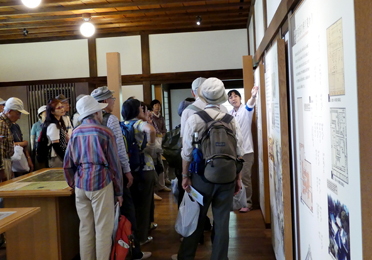 In the gallery of Historical Exhibiton, we display panels that explain history of Kyoto Imperial Palace, city of Court Noble residence, KAN-IN-NO-MIYA remains of residence, and also exhibit discovered artifacts. In the gallery of Nature Exhibition, we display panels that show wild birds, insects, and plants and mushrooms that habit in the courtyard. Also we illustrate some techniques and tools to maintain trees and plans there. 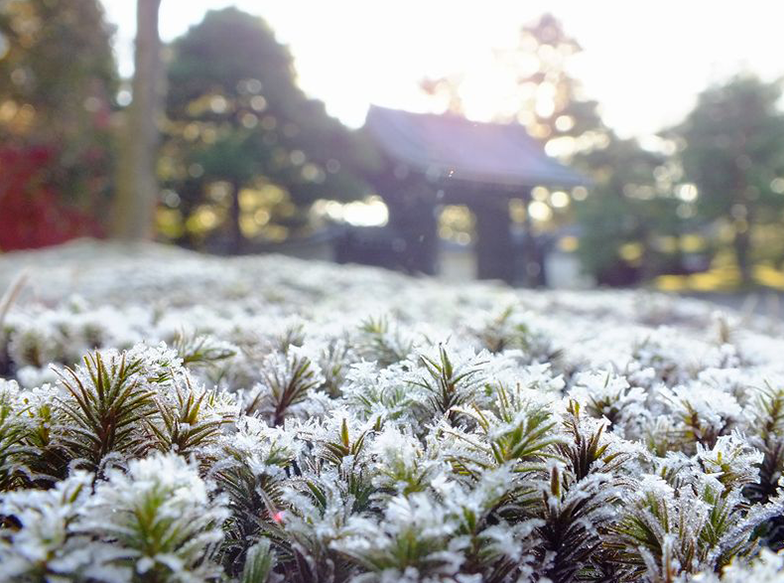 In the movie monitor, you could watch five-minutes short movie about Nature and HIstory of Kyoto Gyoen, either in English, Chinese, Koreans, and Japanese. We also offer "mini guide" twice a day in open days, and "special tour" twice a month. We hope you could join us and get to know more about it. 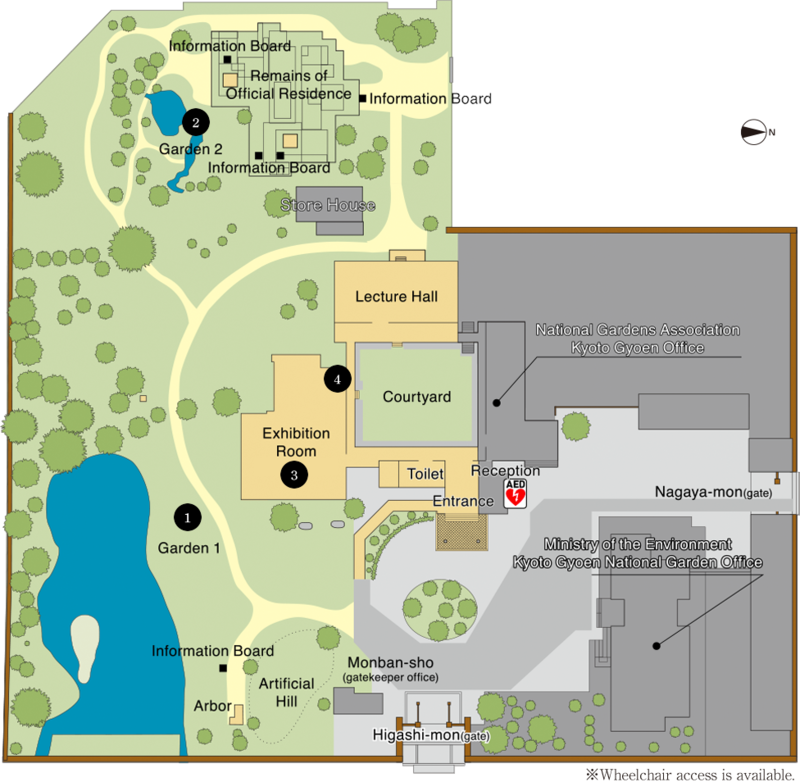 All area except for the gray part on the map is open to the public. 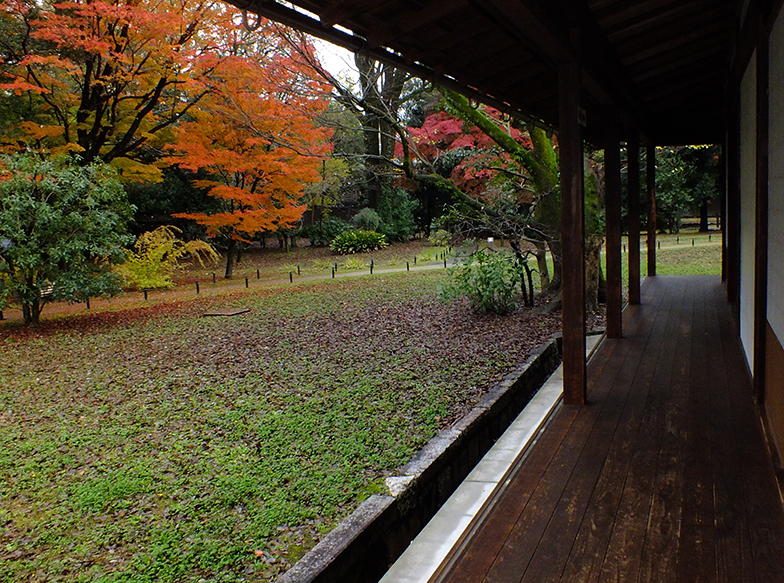 The residence covers an area about 11,400㎡. Entrance is from either Higashi-mon(east gate) or from Nagaya-mon(norh gate). Entering from east gate, you could see a carriage-porch with triangle decoration on the roof called "Chidori-Hafu", one of building method. 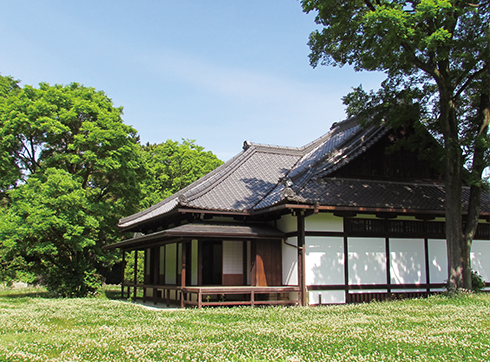 On the left and right, you could recognize "Shoin-zukuri" building with its dignity. 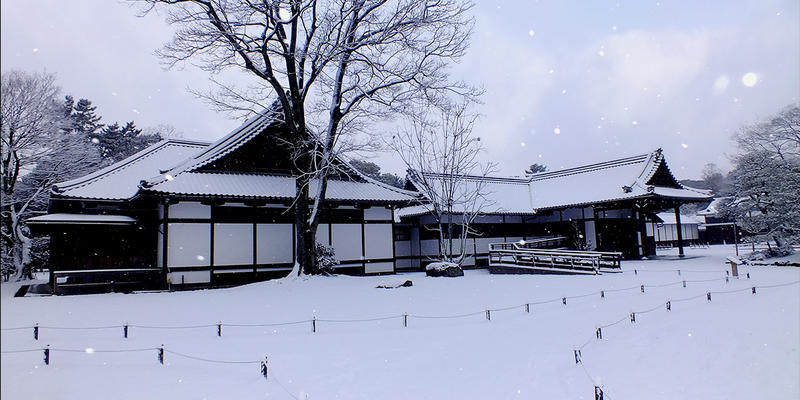 It is approximately 860㎡ scale and has a shape of rectangle with its courtyard in the middle. The pond located in the southeast of the residence was reshaped in a reconstruction at the time of coronation ceremony of Emperor Taishou. 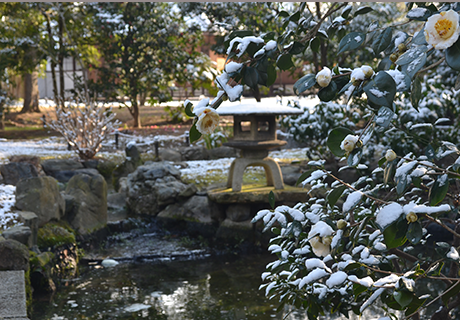 Research before restoration of the garden revealed that the original pond had a pebble beach known as a "suhama", which indicates that the garden was designed in a favored style by Imperial Families and Nobles at that time. We restored the suhama design by additing a gentle slope to the bank while presevring the materials of the old pond. Research has confirmed past existence of a stream(Yarimizu) and ponds in the garden. The stream is speculated to have used tap water of Kyoto Gyoen which came from Lake Biwa, the biggest lake in Japan. The residence of the director of the Imperial Household Agency built in 1892(Meiji Era 25) has been restored its room layout. 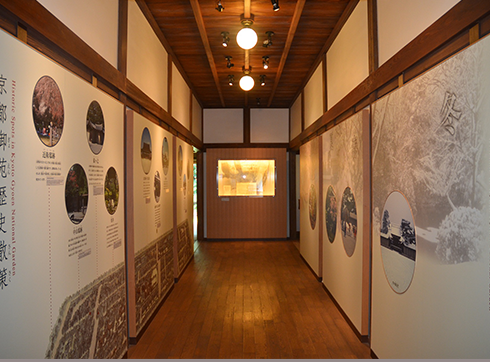 The exhibitilon room shows the history and the nature of the Kyoto Gyoen National Garden. 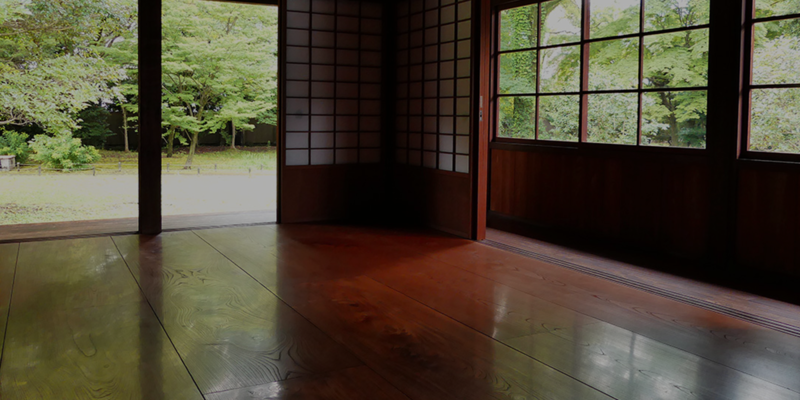 There are antiques found from excaation at the Kyoto Guest Palace. There are also many books available for reference in the library corner. This room is the most gorgeously built among the south buildings. It comes with veneered and naked beam on the ceiling, installing the decorative support, which is called "Kaeru-mata" meaning "open-legged frog" from its shape. 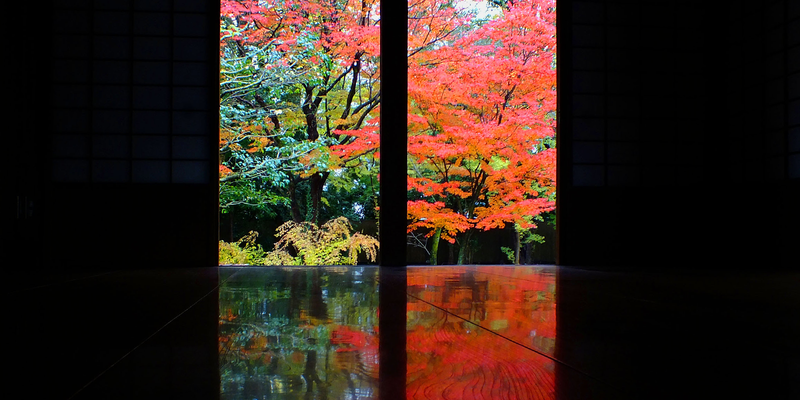 The beautiful Japanese maple reflection on the floor is one of the remarkable scenery. 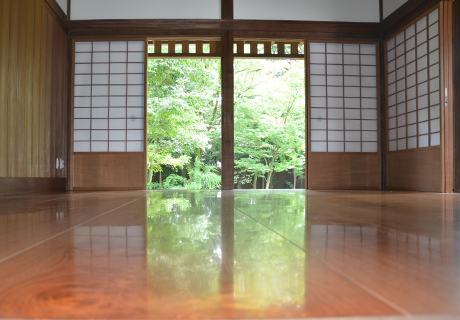 In fall, the autumn colored maples, and in spring and summer time you could enjoy the fresh green maple reflection on the floor. 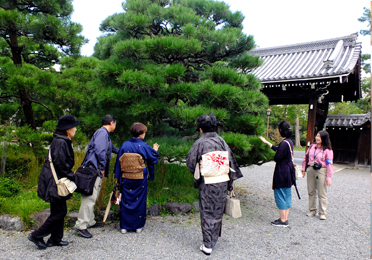 PR staff will offer a special tour for nature, history and cultures related to Kyoto Gyoen twice a month. Every 1st and 3rd Saturday of each month, 1:30pm - 2:30pm. Please check the details at the latest information page of 'Event&Seminar" on our website. In front of movie monitor, at storage exhibition room, located in KAN-IN-NO-MIYA residence site. At site (please come 5 minutes before of the scheduled time). Admission free. We offer a mini guide twice a day in opening days. The guide is about history of Kyoto Gyoen and KAN-IN-NO-MIYA family. *Kindly note that time schedule might be changed or cancelled depending on convenience. At site. Please come to Storage Exhibition Room in KAN-IN-NO-MIYA residence. Admission free.